Among other things, the center aims to support the livelihood of the people of Luang Prabang and promotes the ethnic minority groups in the city. Thus, if you have ever been curious and interested about the many underrepresented tribe groups in Luang Prabang, this is the place to learn more about them. The Traditional Arts and Ethnology Centre provides a place for the ethnic groups to put their craft on exhibit and a store where locals and foreign tourists alike can buy their work. It brings the ethnic people of Luang Prabang who depend solely on weaving as their source of income closer to the consumer public. As a museum, the center features traditional clothing, weaving apparatuses, tools, religious artifacts, household wares and various hand-woven products. All the items reflect the cultural practices of the seven ethnic groups such as the Akha, which features the diversity of ethnic groups; the Hmong, which focuses on Hmong New Year Festivals; the Khmu, which exhibits baskets and back strap apparatuses; the Mien Yao showing the Art of Embroidery; the Mun Yao, which celebrates Lanten and Taoist Religious Ceremonies; the Tai Dam, which features Handmade Bedding Materials and the Tai Lue, which demonstrates Cotton Clouds to Cloth making. Directly obtained from these villagers, the handicrafts are all exquisitely made and completely characterize Lao traditional weaving. In addition, the displays also come with information written in Lao, English and French. It is hoped that all these are helping the people understand and appreciate ethnic diversity, lifestyle, culture and heritage of the locals. In the future, the Traditional Arts and Ethnology Centre also hopes to include workshops with artisans, design development of the handicrafts, specialized tours, educational trips as well as temporary exhibits, as part of their offerings. To keep up with the changing technology, the center also plans to install a resource center with DVDs, articles, photographs and various books that can be viewed from interactive programs in Internet-capable computers. Beside the center, there is also the Le Patio Café, which serves drinks and food. 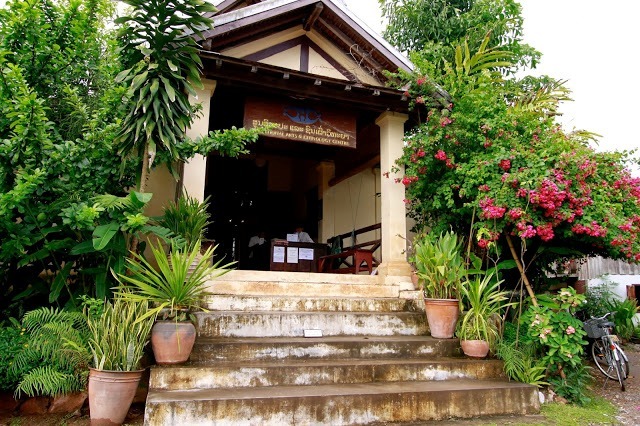 Inside you can enjoy a view of the Phou Si Mountain and browse through several literatures that are available to guests. Also, the store selling handicrafts is just behind the center. All in all, visiting the center is a great way to spend your day. You’ll learn more about the culture of the country and discover the different tribes of Luang Prabang. Opening Hours: The TAEC is open from 9:00 A.M. till 6:00 P.M. every day except Mondays. How to get there: The Traditional Arts and Ethnology Centre is located just at the foot of the Phou Si Mountain behind the Dara Market. To get there, simply walk towards the mountain from the Kitsarat Road. Watch out for road signs and you’ll soon be greeted by the sight of the building.